Figure 2595 (a) shows a streak image, consisting of 1024 EEL spectra, with the zero-loss peak (ZLP) taken in a microscope with a cold field emission gun (CFEG) and an exposure time of 0.353 ms (total exposure time is 0.36 s). 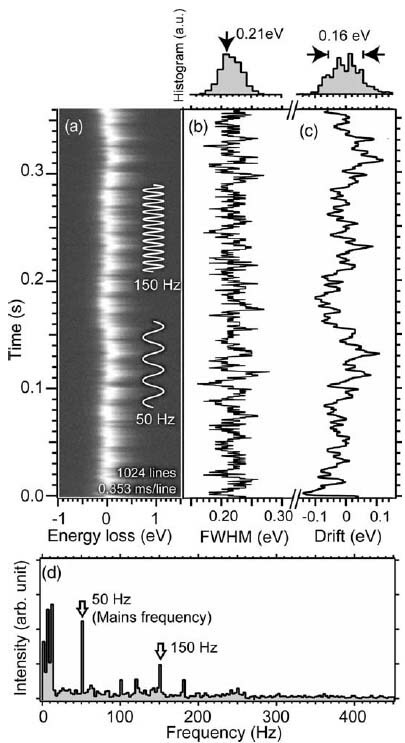 Figure 2595 (b) and (c) shows the FWHMs (Full width at half maximum) of the ZLP and the energy instabilities measured using cross-correlation, respectively. Figure 2595 (d) shows the Fourier transform of the instability, revealing several peaks with the major peaks at 50 and 150 Hz, originating from the mains frequency field. Kimoto et al. proposed that the peak at ~10 Hz might be an eigenfrequency of the mechanical vibration of the Gatan GIF2002 EELS system. Koji Kimoto, Kazuo Ishizuka, Toru Asaka, Takuro Nagai, Yoshio Matsui, 0.23 eV energy resolution obtained using a cold field-emission gun and a streak imaging technique, Micron 36 (2005) 465–469.